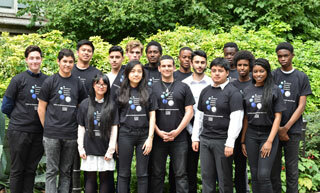 This summer, 17 sixth-form students from two south London non-selective state schools had the opportunity to witness and experience first-hand what it is like to be a researcher. As part of the first edition of DevNeuro Academy, our Centre’s flagship widening participation project, the students were selected to take part in a two-week laboratory-based research placement. Students from non-selective state schools are widely under-represented at top universities. 48% of privately educated children go on to study at a highly selective university, whilst only 18% of state school children, and a staggering 2% of children eligible for free school meals, gain such a place. The primary objective of the DevNeuro Academy project is to engage with local non-selective state schools and contribute towards changing these numbers. 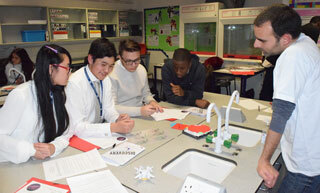 The first edition of the programme had the collaboration of the City of London Academy and St Michael’s Catholic College. More than 30 PhD students and Postdoctoral researchers from our Centre developed and delivered four in-school interactive ‘Discovery workshops’ on Neuroscience to nearly 50 pupils. Throughout these four months, the students were provided with solid conceptual foundations as well as skills and new ideas to further build on. Each workshop combined talks and a series of interactive exercises about the exciting field of developmental neurobiology. At the end of the workshops, the students had to submit an application for one of 17 spaces on the two-week research placement in our Centre. I still remember filling in that application form and thinking, "what am I getting myself into?" An unforgettable 2 weeks was what I got. I was able to help image the cultured cells after immunohistochemistry, which was part of my project. Second, I was given the awesome opportunity to shadow one of my supervisors as he demonstrated part of his research. 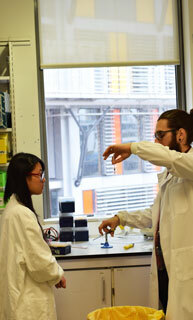 Throughout the two weeks, each student, under the supervision of a Postdoctoral researcher and a PhD student, developed their own project and learned various molecular and cell biology techniques from performing cloning and expression of GFP tagged proteins in rat neurons, to controlling and monitoring activity in neurons using light (optogenetics) and electrophysiology. The students also had the opportunity to visit some of King’s cutting edge core facilities such as the Nikon Imaging Centre, where they saw state of the art light microscopes, and one of the largest standalone zebrafish facilities in Europe. During these two weeks the students also had lectures on how to master their personal statements and managing their finances, as well as the undergraduate options at King’s. This was an extremely valuable experience because it doesn’t just give you an outlook on what it is like being a researcher but also an outlook on the subject of science a whole. Thank you for this amazing opportunity! The programme concluded with the students’ graduation ceremony, which was attended by their supervisors, teachers and family members. After two weeks of hard work and exciting discovery it was time for the students to present their research results, through scientific posters, presentations, and even a live demonstration of dissection! The students proved to be excellent ambassadors when they engaged with the visitors of King’s Guy’s Campus Open Day, as they were presenting their research project and explaining their results. The next edition of the DevNeuro Academy project will start in September. The DevNeuro Academy project is supported by a grant from the King’s Widening Participation Department.